I've attended a 6-week residency in San Miguel de Abona, Tenerife, been selected as Candida Stevens Gallery artist-in-residence for 2017, and awarded a bursary for a residency at Stiwdio Maelor. I've taken part in 9 exhibitions including Inarticulate Landscapes at Unit One Gallery, London and Good Nature, Candida Stevens Gallery - my work shown alongside David Nash RA and Alice Kettle. I was awarded a scholarship to study for a practice-based PhD at Farnham UCA and was long listed for a second QEST scholarship. 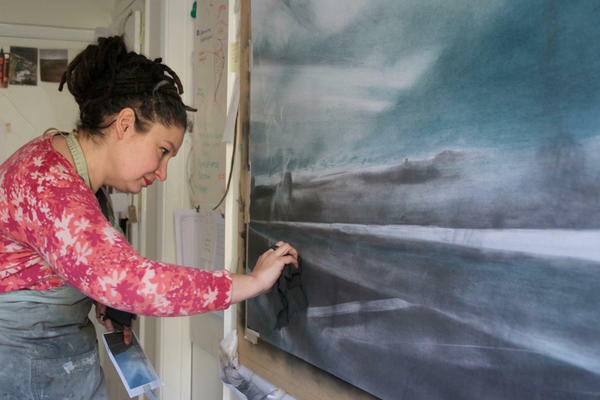 I've also begun teaching short courses at West Dean College and Pallant House Gallery, and offering mentoring to other artists. Earlier this year I was interviewed by Arts Quest Sussex for their Arts Visionaries series. I'm now in my second year of the PhD using the research material from the San Miguel residency as the basis for large drawings and metal sculptures - working towards an exhibition of these works later in 2018. I'll be attending the Stiwdio Maelor residency in March 2019, which will also form part of my current research. I'm teaching several drawing related courses at West Dean College and mentoring FDAD alumni. I'm also in the planning stages of writing a practical book about drawing in charcoal. What do you consider your biggest achievement to date? Thanks to the MFA programme, I've achieved quite a few things I didn't believe I was capable of, so it's hard to name just one. The top 4 would be: being awarded a prestigious QEST scholarship, being selected as the Edward James Foundation Scholar 2016 and gaining Distinction at MFA and then going on to exhibit alongside the sculptor David Nash. Do you have any tips for recent graduates wanting to establish themselves as an artist? You should seek out and create opportunities, to exhibit and to keep learning and developing your practice. The business side of being an artist can get in the way if you're not careful, so it's important to set aside and protect time to be in your studio - you have to keep making work, that's the core of it all. Create an Instagram account that shows you're serious about your career, don't fill it with pictures of your food/pets/family. There was an emphasis on self-directed practice, and the importance of research and developing concepts as well as practical skills and also applying for opportunities right from the start of the course. Because of the possibility for immersing yourself in your practice, it made me realise the importance of setting aside everyday distractions to allow for focus on your practice. The Visual Art tutors encouraged us to be brave enough to allow the work to go where it needs to go, and that was incredibly valuable. That's also difficult to narrow to one, perhaps the privileged of having an hour long, one to one tutorial with eminent painter Basil Beatie, or getting to fly owls on the front lawn of the college, or watching a film on a big screen in the Oak Hall with popcorn in huge silver bowls, or meeting fellow students on the hill in front of Dower House (student accommodation) for a drink after finishing late in the studio. It was a wonderful two years, full of rich and sometimes otherworldly experiences so it's impossible to narrow it down to one.